She expected to die young. Then came the call that offered new life. 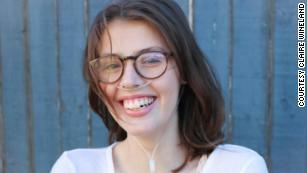 Claire Wineland has cystic fibrosis and vowed she’d never seek a double-lung transplant. But she had a change of heart, wasn’t ready to die and worked hard to get on the waiting list Complications got in the way, though, and then came the call that would change everything. (CNN) Having spent a quarter of her life in the hospital, she knows how to sleep through noise. She’s so good at it that she worried the phone call wouldn’t wake her. But when her cell rang at about 5:30 a.m. Sunday, she was ready. 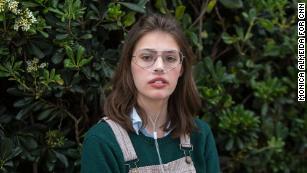 On the other end was the news Claire Wineland had been waiting for: Doctors had found a pair of donor lungs. She’d been on the transplant list for just over two weeks after months of uncertainty. Now she was getting her chance at an extended life. Claire, 21, gained social media attention starting in high school with her frank — even funny — YouTube videos about growing up with cystic fibrosis. At 13, she started a foundation to help other families affected by the genetic and progressive disease, which can be terminal. At 14, she started sharing her beyond-her-years wisdom from stages. Claire Wineland has spent a quarter of her life in the hospital. There is no cure for cystic fibrosis, which causes an overabundance of mucus, traps infections and blocks airways in the lungs. It complicates digestion, affects the pancreas and other organs and, eventually, leads to respiratory failure. Dutiful treatments eat up hours each day and can help ease complications and symptoms — until they don’t. But CFers can add years to their lives with double-lung transplants, assuming the surgery is successful. 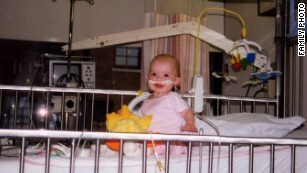 For years Claire dismissed the idea of a transplant. She was of the mind that she would live a meaningful life for as long as she could and that she’d leave the world with the body she came in with. Period. Earlier this year, though, her deteriorating health forced her to do some soul-searching. Unable to travel, work and do what she loved, she had a change of heart. She realized if she didn’t get new lungs, she would die sooner than she was willing to accept. Getting on the waitlist, though, was not a given. It required a thorough, grueling evaluation by a large team at the Center for Transplantation at UC San Diego Health. To qualify, they had to know she was sick enough to need lungs yet strong enough — physically and psychologically — to handle the surgery and life afterward. She took to Twitter at the end of May to share the news that she was an approved candidate. “It’s a YES!!! !” Claire Wineland posted on Twitter when she learned she was on the transplant list. Her supporters joined in the excitement, offering prayers, congratulations and GIFs. “My lungs are telepathically saying hello to your future lungs,” wrote one person. “Where do I get my #TeamClaire T-shirt?? ?” asked another. The joy of making it onto the list, however, was quickly tempered by a barrage of complications — some health related, others simply life related. Living on the list isn’t just about waiting. It’s hard work, doesn’t happen in a vacuum and can come with unanticipated stressors. Just two weeks after making the list, a CT scan showed Claire had fungal balls, or clumps of mold, in her sinuses. If left untreated, the fungus would infect new lungs, “so everything came to a screeching halt,” Claire’s mother, Melissa Nordquist Yeager, explained. Determined to locate the source of the infection, Claire and her roommate asked their property managers for an inspection of their leak-laden apartment in Venice Beach in Los Angeles. The place turned out to have high levels of mold. For months her health had been spiraling downward, despite being diligent with her treatments. Now, suddenly, she had a possible explanation — and she had to get out. Fast. Related Article: Why a terminally ill young woman has changed her mind about living. She and her roommate threw everything they had in plastic bags and fled. They went from one Airbnb to another. A tree branch fell onto the back porch of the first. A gas leak forced them out of the second. A short-term lease they signed in LA’s Silver Lake neighborhood offered a reprieve but too many stairs, which proved exhausting for Claire. She says they moved four times in the span of a few weeks. In the middle of all of this, their beloved pit bull Daisy got sick. They first wrote it off as a nervous stomach, but when they took her to a vet, they learned cancer had metastasized throughout her body. They had no choice but to put Daisy down. Stressed, emotionally crushed and unable to focus on her self-care and treatments — her full-time job at that point — Claire began to slip. The strong antifungal medication she was on didn’t help. Her mom described the effect as comparable to chemo. Claire couldn’t tolerate it and developed purple welts all over her body. “I looked corpse-like,” she said. She had diarrhea, grew nauseous and had no appetite, which is problematic for a person who needs to take in 5,000 calories a day. She lost 6 pounds, none of which she could afford to lose. She fell below the BMI range needed for a transplant. By early July, the transplant team at UCSD had no choice but to put her on “Status 7,” a designation that, at least temporarily, took her off the active list. Being knocked off the list might have devastated others, but for Claire it was a relief. The day after her status changed, she posted a video unlike any before. A self-described “goofball,” Claire is known for her bright smile, humor and optimistic-but-honest talk. When she hit the record button this time, though, she fought back tears and pleaded for help. Claire has always had plenty of emotional support. Now, unable to work and terrified about what the months ahead would look like for her and her family, she sought financial support. “I’ve never felt so embarrassed in my entire life,” she said. It was an ask, posted on a GoFundMe page, that made her cringe. She was used to raising money for others through Claire’s Place Foundation, which she imagined at age 13 after coming out of a 16-day medically induced coma. The foundation offers financial assistance to struggling families affected by cystic fibrosis. For Claire, this was new, raw and swallow-your-pride territory. But it was something she felt she needed to do. She worried how her journey would affect those who loved her. What if her parents poured everything into supporting her transplant only to lose her and everything they have? What if she survived but couldn’t work for a year or longer? What if the next apartment she moved to wasn’t a good place to heal? What also messed with her were concerns about whether she deserved the transplant. All of this drove her when she turned to the camera. 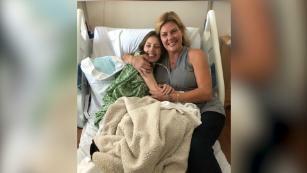 Her mother had set up the GoFundMe page to cover expenses for the three to six months Claire would need to relocate to San Diego to live near the transplant center after surgery. She’d raised $7,000, reaching out to everyone she knew. Six hours after Claire posted her video, the pot grew to $100,000. At last count, the page had raised more than $237,000. The outpouring of donations, more than 8,000 of them, overwhelmed her. The panic that washed over her each day finally dissipated. She was freed up to focus on getting stronger — and getting back on the list. A stint in the hospital helped her gain weight. A different antifungal medication agreed with her. In-home antibiotic IVs got to work beating back a more recent infection. Her days revolved around self-care. Big meals, like breakfasts of eggs, bacon, toast and smoothies, coupled with formula through her feeding tube. Hours of breathing treatments, IVs, insulin and pills. Exercises, including repeated rounds of squats to build up strength. Those were a must, because after a transplant she’d be unable to use her arms and would need to rely on her legs to stand up. Those squats offered more than advertised, she discovered. On August 10, greatly improved, she got back on the waiting list. She was told the call could come at any minute. She wanted to be situated in a new, clean, mold-free apartment with her roommate before it came. They found a place they loved, one without steps, in Silver Lake. The first night they slept there, her phone rang. The doctors had warned Claire that one out of three potential donations aren’t a good match, said Yeager, her mom. There was a chance the lungs she raced to San Diego to receive wouldn’t, upon further examination, become hers. Still, when she arrived at the transplant center Sunday morning, she was admitted and put on anti-rejection drugs just in case. By early afternoon, she learned this was no dry run. By asking for help, she was “making a promise to everyone else that there’s something at the end of this. … It’s for something, and it’s going somewhere.” Claire wanted people to know she would continue giving back. Team Claire sent her off with cheers and prayers, and they rallied together not just for her but for the donor’s family. Claire was wheeled into the operating room before 2 p.m. PDT Sunday. Her surgery began about an hour later and lasted nearly nine more. Word filtered out that it went well, that Claire’s color and vitals were good. Before midnight, she was rolled into ICU for recovery. Fear of germs meant even her mother couldn’t yet visit or touch her hand. So from the waiting room, her mom did the only thing she could. She posted a video of herself with two friends, including Bailey, doing a happy dance. Tuesday morning, Claire will be woken up, according to one of the transplant team’s pulmonologists, Dr. Kamyar Afshar. Once it’s clear that she can “follow commands and protect her airway,” the breathing tube will come out. At that point Claire, who’s never known what it’s like to have clear lungs, will breathe in — for the first time — her new life. This story was originally posted to CNN.com on August 28, 2018.